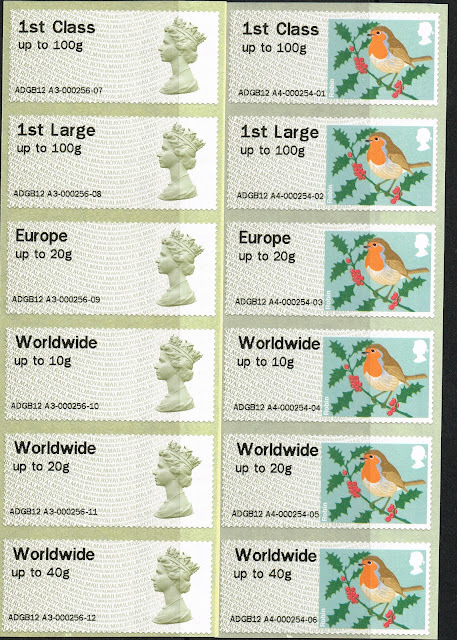 Thanks to Doug and Dominic I can show the latest output from London, being the new BPMA overprinted Hytech Faststamps, and the December version of the unoverprinted Hytechs from Camden's Christmas shop. "If people hand their covers to the Search Room staff by mid afternoon they can get our special handstamp." It seems that these are the machines last used at Perth, and the session numbers have not been reset to zero. If I recall correctly they weren't zero when they arrived at Perth either. Click on the images to see much larger ones. At the end of the year the BPMA code will change to AJGB13, we assume. Brian reports that it will be A1GB13 - see comment. UPDATE 11 December: The BPMA had produced a small number of FDCs with 2 x 1st class stamps, one of each. 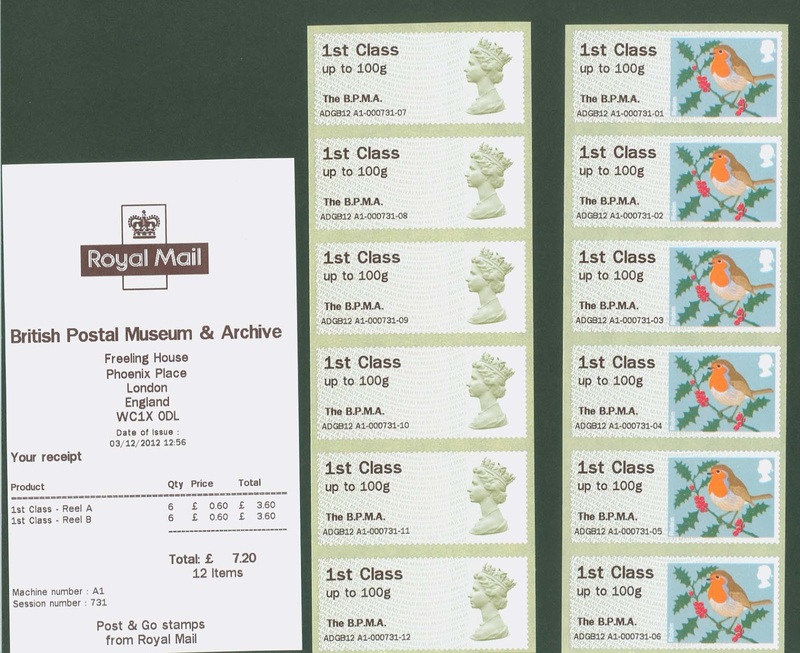 FURTHER UPDATE 19 DECEMBER: Following a report on the GBStamps blog that these were all sold out BPMA have now said that they have more and are releasing them in batches. Whether this means just the original 50 or that they did many more, is not clear. Given that the handstamp is in the Mount Pleasant Special Handstamp Centre, presumably more could be done - though that would mean backdating which wouldn't happen, would it? BPMA have confirmed that the quantity total is 50, currently being sold over two sites. With regards to year codes I have read on Postage Labels UK website that it is numbers 1-9 for January to September and then letters O, N, D for October, November and December. Ah, thank you. I don't remember everything that Brian writes there! I did wonder about June July and January, and April and August. The first 'A' is the reel identifier - not yet working as it is 'stuck' on 'A' but will change to A/B at next software upgrade. The 'A' part of the machine identifier 'A1' indicates 'Self Service', with 'B' indicating 'Attended Service' and 'C' Production/Bulk. "The first 'A' is the reel identifier " - that'll be the second 'A', Brian, as in A2-000nnn-nn ?